Life is Worth the Walk held an event at American River College on Thursday to support mental, physical and spiritual wellness. “We started to raise awareness for suicide prevention and bullying prevention,” said Cindy Marks, co-founder of Life is Worth the Walk. Life is Worth the Walk is an organization that helps students who suffer from mental illness and also students who are experiencing bad days. “You don’t need mental illness to have a sad moment,” Marks said. Students were able to come into the student center and make bracelets to help promote awareness. 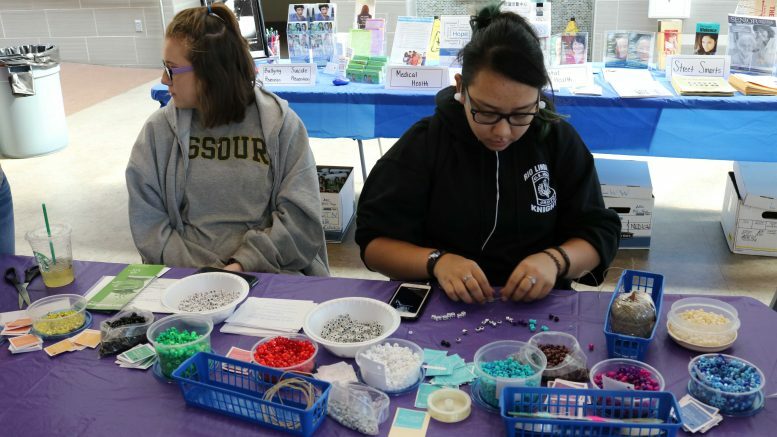 Some students said they were making bracelets in remembrance of lost family members. There were brochures and “positive affirmation” papers for students in need. The positive affirmation papers are filled with words like “courage” and “success” to keep students hopeful in case they are having a bad day or experiencing a moment of crisis. “We want to bring resources to the community and hopefully get a wellness center on California campuses,” said Margaret Scott, an ARC professor. Students now have resources that were unavailable a few years ago. Students suffering from mental illnesses or experiencing stress can now be open with their feelings and speak to professionals on campus. “We want to bring awareness to students more often. We see what’s happening with students and it’s important that we help,” said Frankie Johnson, ARC faculty member. Be the first to comment on "Life is Worth the Walk brings mental health awareness to ARC"